Hi! I am a first year graduate student in the Astronomy & Astrophysics Department at the University of Chicago. I received my undergraduate degree in Astrophysics from Tufts University. Outside of academics, I have an addiction to baking, love crocheting, writing short stories, and sitting out by Lake Michigan. My work focuses on stellar and exoplanet astrophysics. 231 AAS Meeting January, 2018 Washington, D.C. I've had the fortune to work on several projects throughout my undergraduate career. First and foremost, my undergraduate research conducted at Tufts University focued on calculatin gravitational lensing factors and associated errors for sources located in the Hubble Frontier Fields campaign. Using the information of the photometric redshift of the background source and the redshift and mass map of the foreground lensing cluster, I applied the strong lensing equation to estimate the magnification factor for the background source. Additionally, I calculated systematic (from different mass maps) and random (from uncertainty on the photometric redshift) errors on the magnification factors. Our collaboration, as well as my personal contribution of the lensing catalogs, is publicly available and can be accessed here. The publication associated with this work can be found on the ArXiv. Above is a strong lensing event found using the galaxy cluster Abell370. To the left, a red-green-blue image of the cluster with a zoomed in area around a lensed background galaxy (lovingly named the dragon). To the right, a segmentation map of the lensing cluster and the associated magnification values of the galaxy (yellow = small lensing factor; black = large lensing factor). This work was also the basis of my undergraduate senior honors thesis and the publicly available HFFDeepSpace catalogs can be found here. A smaller, side project studying the evolution of massive galaxies (11 > log(M/M_Sun) using the UltraVISTA Catalogs was the second portion of my thesis. I was fortunate enough to work as a summer intern at NASA Goddard Space Flight Center the summer following my junior year of undergraduate studies. My goal was to identify young stars to further confirm their membership in nearby young moving groups, clusterings of stars with similar ages and galactic motion. Because young stars are still contracting, gravity-sensitive spectral features are used as age indicators in low-mass stars; younger stars will have weaker spectral features than their older counterparts. I wrote a program that identified 27 young stars in my sample. The figure here is a demonstration of 4 identified young stars (blue) vs. a standard of the same spectral type (black). One can see that the spectral features of the young stars are weaker than those of the standard. Observations from the Kepler and K2 missions have provided the astronomical community with unprecedented amounts of data to search for transiting exoplanets and other astrophysical phenomena. Here, we present K2-288, a low-mass binary system (M2.0 +/- 1.0; M3.0 +/- 1.0) hosting a small (Rp = 1.9 REarth), temperate (Teq = 226 K) planet observed in K2 Campaign 4. The candidate was first identified by citizen scientists using Exoplanet Explorers hosted on the Zooniverse platform. Follow-up observations and detailed analyses validate the planet and indicate that it likely orbits the secondary star on a 31.39-day period. This orbit places K2-288Bb in or near the habitable zone of its low-mass host star. 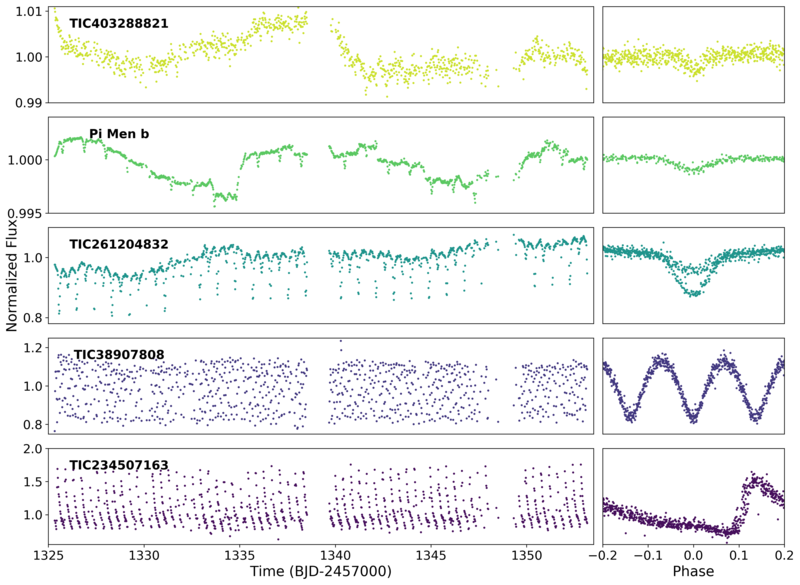 K2-288Bb resides in a system with a unique architecture, as it orbits at >0.1 au from one component in a moderate separation binary (aproj approximately 55 au), and further follow-up may provide insight into its formation and evolution. Additionally, its estimated size straddles the observed gap in the planet radius distribution. Planets of this size occur less frequently and may be in a transient phase of radius evolution. K2-288 is the third transiting planet system identified by the Exoplanet Explorers program and its discovery exemplifies the value of citizen science in the era of Kepler, K2, and the Transiting Exoplanet Survey Satellite. Read the rest of our paper on the ArXiv!